It’s March and that means two things–spring is in the air and college basketball is about to take over. According to a WalletHub infographic, nearly 81 million people tuned into the NCAA’s live mobile app to watch the basketball tournament on their phones, tablets and laptops in 2015. The madness around the tournament has millions of people talking about the event on social. In fact, WalletHub said the NCAA tournament drives roughly 350 million Twitter and Facebook impressions each year with bracket predictions, upsets and cinderella stories. For casual and diehard hoops fans, filling out a tournament bracket is a beloved ritual. The American Gambling Association recently stated more than 70 million NCAA tournament bracket sheets will be filled out in 2016, amounting to roughly $9.2 billion in betting. For a lot of fans, picking teams is a blind decision where winners are chosen by jersey colors, alma maters or favorite mascots. However, some people like to go the extra mile and use math and statistics to determine their projected winner. 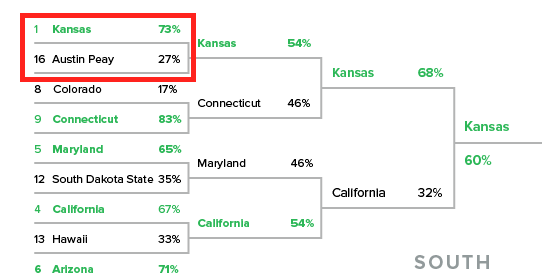 For Sprout Social’s NCAA bracket predictions, we looked at social media analytics. 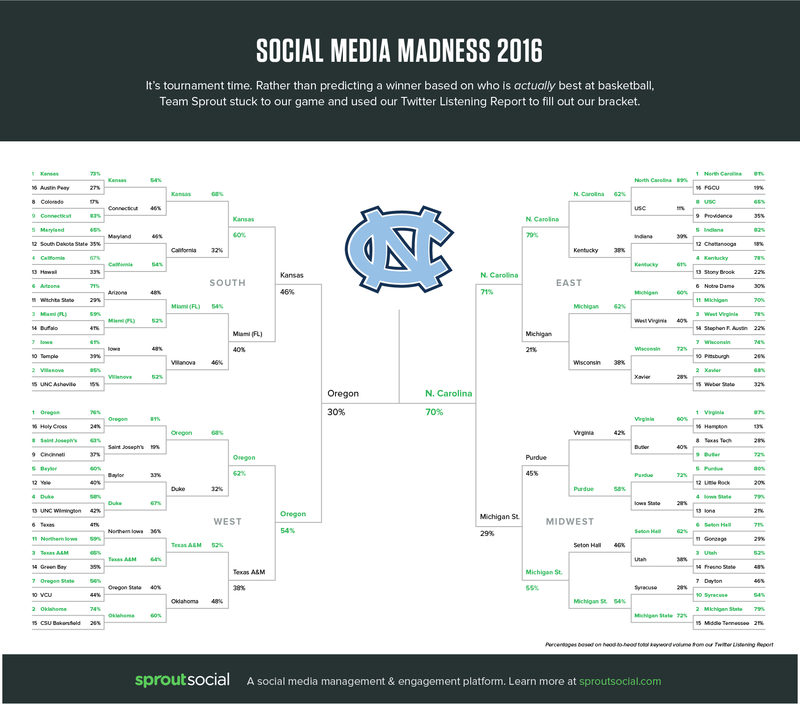 Last year we got our feet wet in the tourney pick-em by using Sprout Social’s Twitter Engagement Score for to measure social interactions revolving around each university. Let’s just say our bracket predictions were a bit off. 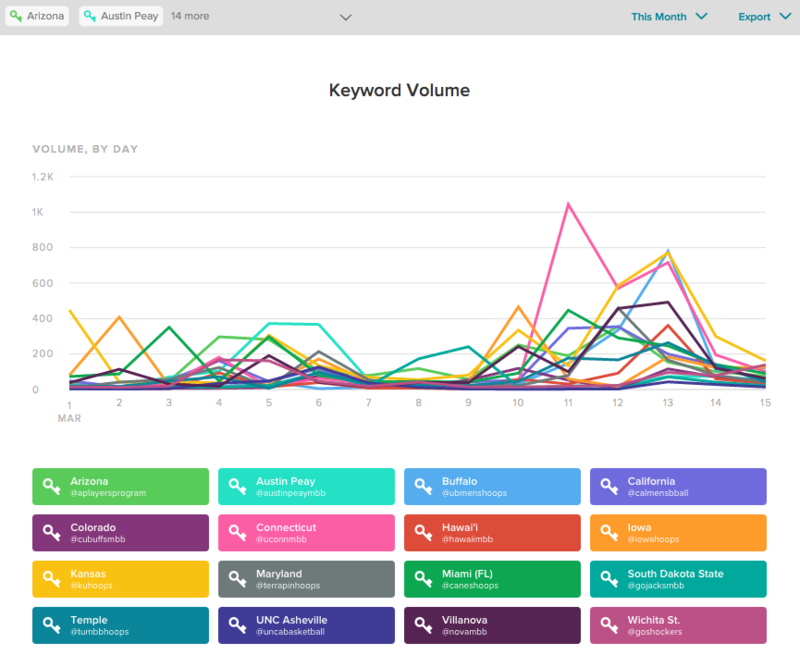 For the 2016 Social Media Madness, we used Sprout Social’s Twitter Keyword Report to pick our winner. Our Twitter Keyword Report gives us the ability to measure @mentions, hashtags and keywords. But, in order to keep our social media predictions as accurate as possible, we only measured each basketball team’s official Twitter handle. While we could have used hashtags and other related Twitter accounts to get more data, the info would have been skewed. For example, most schools have an official account for their athletics department, football team and women’s basketball team. Including a hashtag like “#GoJayHawks” could inflect the findings. Once we had the 64 handles, we broke them up into four groups of 16, with each group representing a region (like a standard NCAA bracket). We set our Twitter Keyword Report to measure the total keyword volume from March 1–15. 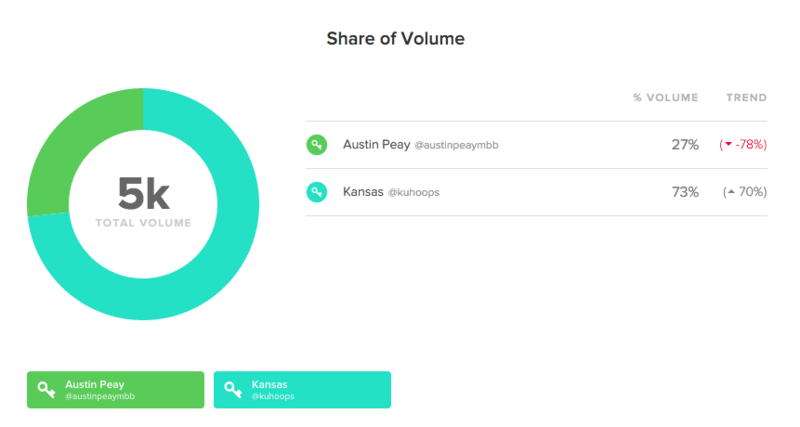 To pick our winners, we put teams head-to-head and chose the college with the greater volume of keyword usage. Here you can see all 16 teams within the South Region and the total volume per Twitter handle for each. We took the teams scheduled to play one another and made our decisions from there. In this instance, Kansas is set to play Austin Peay in the first Round of 64. We put the team’s official Twitter handles @kuhoops against @AustinPeayMBB. 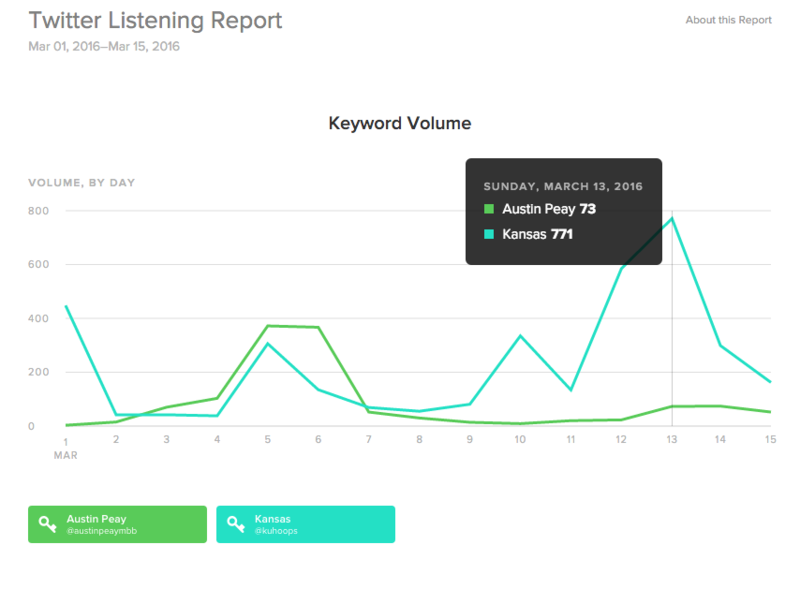 Of the approximately 5,000 instances where either handle was mentioned, Kansas had 73% of the total keyword volume, while Austin Peay made up the remaining 27%. Each winner moved on to the next round and had its Twitter handle volume measured against the next opponent. What Decides the Keyword Volume? If you’re wondering how Twitter analytics could be so cautious with its picks, it really comes down to keyword usage. With Sunday’s picks coming in, there was a lot of buzz on Twitter around each team, which had many Tweeting at the college hoops handles. With the high percentage of No.1 seeds and popular universities making it far in our bracket, it makes sense their handles would be used more in this time period. Secondly, schools who barely made it in the tournament are likely going to receive fewer Tweets and @mentions. While our bracket was built only using data from Sprout’s Twitter analytics tools and not based on which team was favored, notable bracket outcomes should still be noted. Some of you diehard NCAA fans might be shaking your head at the idea of letting Twitter analytics decide the winners of the tournament. Only five upsets in the Round of 64. Only four upsets in the Round of 32. Every No. 1 seed made it to the Round of 16. Three out of four No. 1 seeds made it to the Round of 8. Through Sprout’s Twitter Keyword Report, we were able to make what appears to be a relatively safe and smart pick for the winner. According to CBS Sports, North Carolina is currently at 7/1 odds to win it all, which is third-best only to Michigan State’s 11/2 and Kansas’s 5/1 odds. Just like everyone else’s bracket, if there’s a major upset, our picks are toast. But with the volume of Tweets likely to come for a school that pulls off a major upset, if we did the report again, they’d likely be chosen to go much further–hence, the cinderella story. Feel free to come back and check on our bracket as the tournament continues. Happy bracket picking!